Green tomatoes make the best chutney to serve alongside your favourite selection of cheese. The first time I came across green tomatoes was in Delaware in the USA. I had a fried green tomato salad and it blew my mind. That was a good 4, maybe even 5 years ago now and I STILL talk about it, that’s how good it was. I would’ve recreated it at home but to be honest, I wasn’t sure where I’d get green tomatoes from… Are they just unripe red tomatoes? Or are they their own variety? Well it turns out they are BOTH! You can eat unripe (and therefore green) tomatoes but they will be hard and more acidic. You can also get a few different heirloom varieties which are green when ripe. These are usually a much darker shade of green and often have a distinctive stripey skin. Our local farm store has started selling a green heirloom variety which I am SO excited about. I bought a kilogram of them a few weekends ago and immediately made myself a fried green tomato salad and decided to preserve the rest. Autumn is the perfect time for preserving the last of the summer’s fruits and veggies. It’s no secret that I’m a huge pickle fan and often have jars of various veggies in a vinegar based brine. With my huge batch of tomatoes I wanted to do something different – the obvious preserve for these beautiful specimens had to be chutney. I like my chutney’s slightly sweet but also slightly spicy so you will find light brown sugar as well as fresh chillies in this recipe. You can tweak the amount of chilli and other spices so that its a little milder (or hotter) to suit your tastes. The sweet, sour and spicy notes in this chutney mean it needs a punchy cheese that will be able to stand up to it. I like a mature farmhouse cheddar but it would also work well with a Cheshire or Red Leicester. This green tomato chutney recipe tastes best when you leave it 4 weeks to mature. So, if you make it now it will be ready just in time for Christmas! 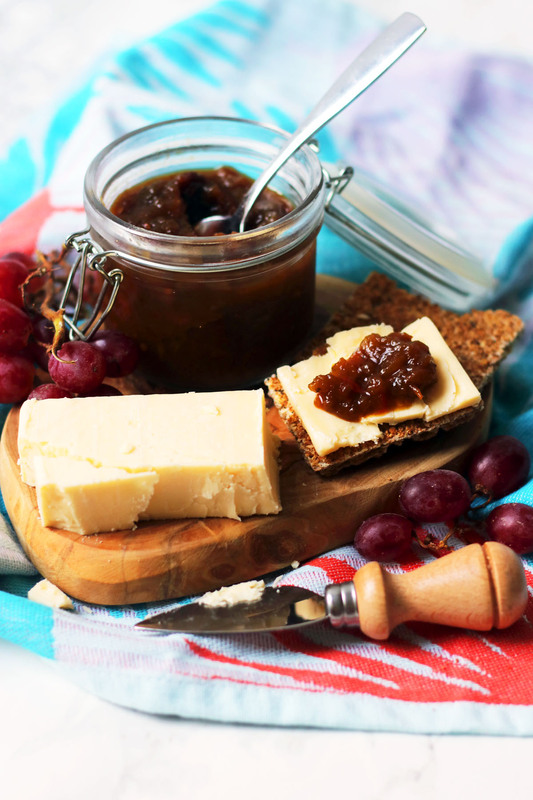 Every festive cheeseboard needs a good chutney. Check out my guide to creating the ultimate cheese board here. This recipe is perfect for preserving green tomatoes. Begin by steralising 3 250ml jars by rinsing them in hot soapy water and placing them upside down in your oven on a low heat. While the jars are drying out in the oven, put the tomatoes, onions and apples into a large pan, along with half of the vinegar. Bring it to the boil and cook for 30 minutes until the onions and tomatoes have softened. Add the spices and raisins to the pan. Reduce the heat and cook for another hour, stirring occasionally until the mixture has thickened. Add the salt, pepper, sugar and the rest of the vinegar to the pan. Stir well until the sugar has all dissolved. Continue cooking until the mixture has thickened and become jammy. Spoon the chutney into your jars while it is still hot. Seal the jars and allow to cool (you will hear the lids of the jars "pop" when they have created an air tight seal). If you just can't wait, the chutney can be eaten immediately but it tastes best if you let it mature for a minimum of four weeks. 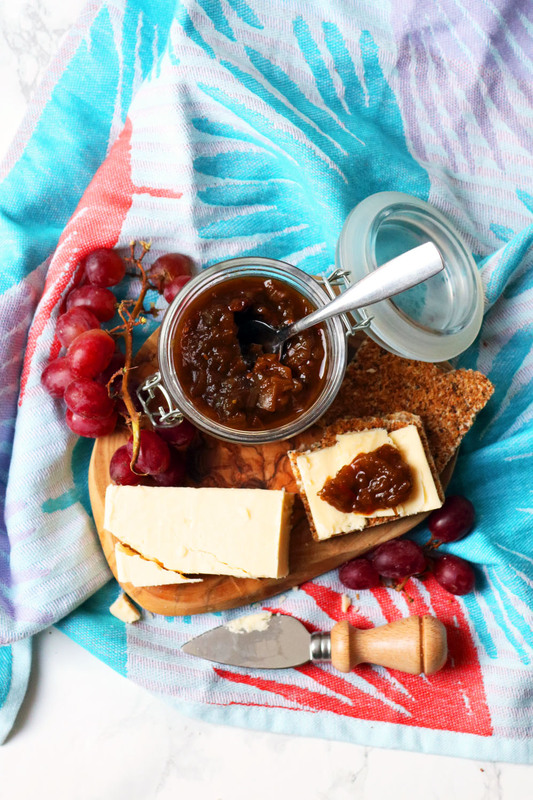 This chutney makes a wonderful gift for food lovers either on its own or as part of a hamper. Why not try one of these other recipes which can easily be gifted. Cheese and chutney takes me right to my (English) mother in law’s table. She shared this combination with me on one of my first visits and I was hooked! Love chutney and I haven’t tried one with green tomatoes. I’ll give it a try! This is great! Just in time for the Holidays! I have to get this added to my dessert menu! No way! This chutney looks like my dream spread. I am absolutely going to be using your recipe. delicious! I love making green tomato chutney, it’s a great way to use the last harvest of tomatoes him the garden, the ones that won’t have the sunshine or warmth to ripen. I use my grandfather’s recipe, yours also looks so good! Had a glut of green tomatoes last year and I made a rice dish with them – this chutney sounds far tastier! Great way to make the most of a glut and always reminds me of the film fried green tomatoes at the whistle stop cafe – lush with cheese!! Hahaha, I like your interpretation of green tomatoes. I’ve always wanted to try fried green tomatoes, ever since seeing the film many many years ago anyway. Your chutney sounds deeeeeeelicious. I do love a good chutney.